Exceptional condo with best view of downtown. 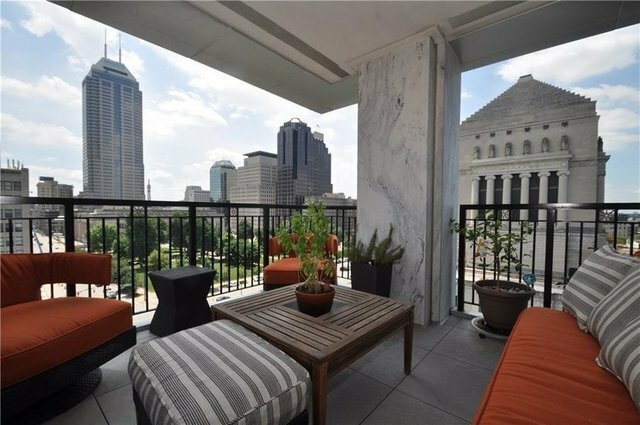 Enjoy views from your private covered veranda (SW corner) overlooking 24 acres of University Park, War Memorial, Legions Mall and downtown skyline. Very high quality features, floor to ceiling windows, Custom Bird Eye Maple woodwork, extensive electronics, steam shower, cabinetry and built-ins throughout by Weberding carving shop of Batesville. Hidden closet behind the moving bookshelves. Gourmet kitchen offers endless Birds Eye Maple cabinets, granite counters, high-end appliances, commercial style range/oven, Meile warming drawer, Advantium oven. Large rooftop patio area with grill, exercise room, private secured entrance and your own garage parking (two spaces). Much more! AgentF. C. Tucker Co. Inc.